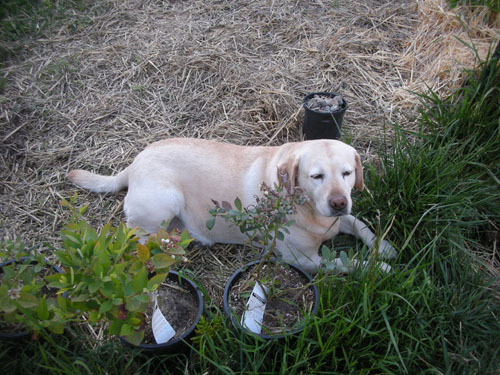 I know, two Garden Reports in a row is not fair to the garden-disdaining readers. So there's a nice complement of animals in here, too. I'll start this edition of the Garden Report by saying that Goldie has really been enjoying lying in the straw where I'm planning to put the tomato bed in a week or so. I feel kind of bad for her that she's going to lose her comfy little nest, but not so bad that I'm willing to go without tomatoes this summer. In other news, maybe having started 25 tomatoes was a bit of overkill. The jury is out. Does anybody local want some small tomato starts? Or should I grow them all and see what happens in August? While Goldie napped in the sun, Rosie helped me show the size of things. The garden has gotten a bit overgrown lately. The salvias have all matured enough that this year they "sprang" the way perennials do, and then some. This Salvia apiana has been hidden away among those invasive ferns (coming in from the neighbor's garden) until it recently sort of exploded. 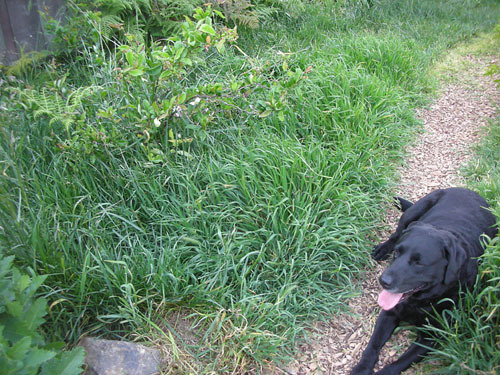 Note that Rosie is sitting in some incredibly tall grass. Apparently warm weather and lots of water appeals to grass. Who knew. That grass has nothing on this grass, because this is an area where I haven't mowed in a few weeks. That's two foot tall grass. You can sort of see the contorted quince bush in there. At the back of the garden I have this little brownish hebe that is having a very subtle growth spurt. I like how the new growth is greenish and matures to dark red. I have a lot of hebes in the yard, because not only are they pretty, but they pretty much love this climate. I like not having to worry about watering a plant after it's established, and still getting nice flowers every year. 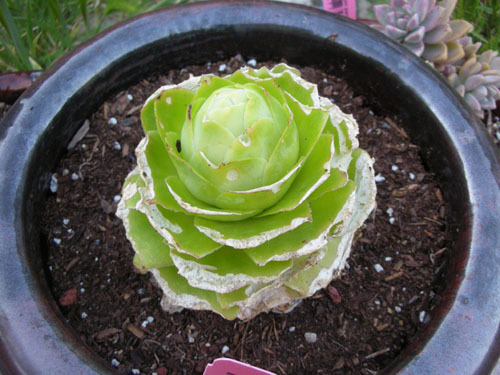 This poor Aeonium in my succulent pot has been totally devoured by snails. I'm half wondering if I could save this pot by putting it in the chicken yard, where snails never venture. Would the chickens kill the succulents more effectively than the snails have done? Or would they leave the plants alone and eat any snails foolish enough to make a dash for the tasty treat? The snails haven't caused any trouble for this little guy, which I got in a tiny pot at Home Depot. Usually plants from Home Depot are half-dead and not worth it, but this one seems to have taken to its new home enough to bloom. I bought it specifically to go in this pot of succulents, and continue to be surprised that it is still alive. Oh, and of course there's blooming going on all over the place. 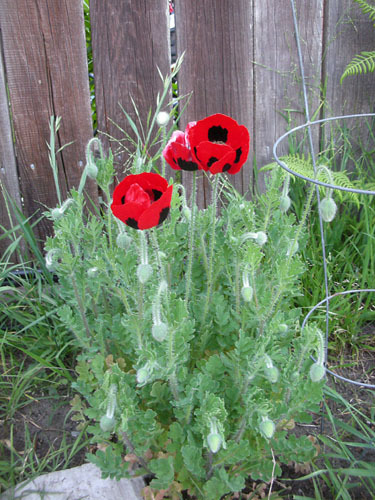 Like the ladybug poppies, which are getting ready to have flowers for weeks by all appearances. This is the best year ever for poppies in this garden. 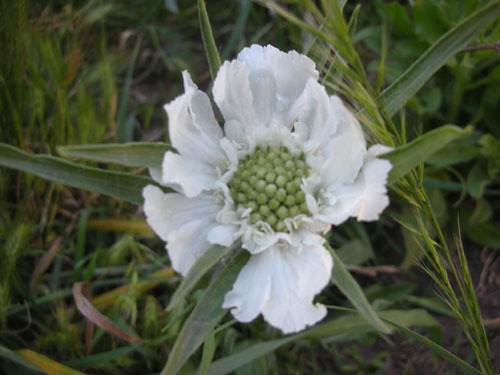 And this Scabiosa caucasica 'Perfecta Alba', which is turning out to be shorter than I expected, but very pretty nonetheless. It's in my big patch of butterfly flowers (scabiosas, mostly). I like the papery petals. Right near that I put this little patch of Sisyrinchium hyb. 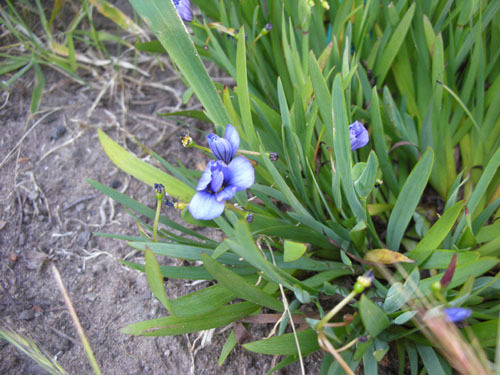 ‘Devon Skies’, a hybrid of a California native (also called "blue-eyed grass"). 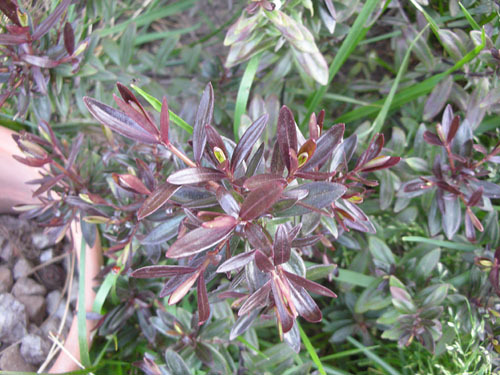 It's a small plant, and worth dividing up and spreading around the garden. When it's not in bloom the foliage is very nice. 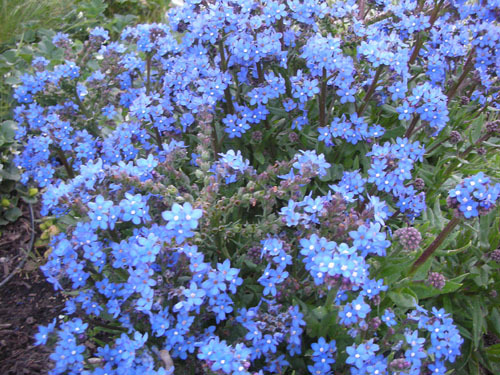 Another very worthwhile plant is this Anchusa capensis. It self-sows, so the fact that it seems to die after two years is less of an issue. And it's gorgeous. And bees love it. I've saved piles of seed from that one. I just need to spread it around. 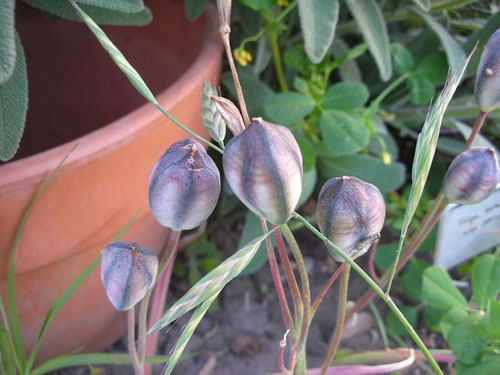 Speaking of seed, the species tulips have finished their run and are now just a bunch of pretty seed pods. They seem like almost another kind of plant when they get to this stage. And now we're on to the next stage of bulbs, including the Nectaroscordium siculum (see the Anchusa capensis in the background? 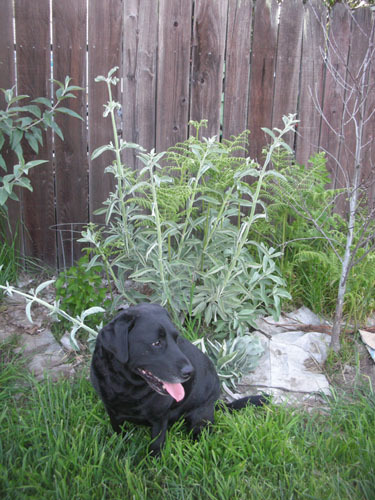 ), which is a sort of funny plant. 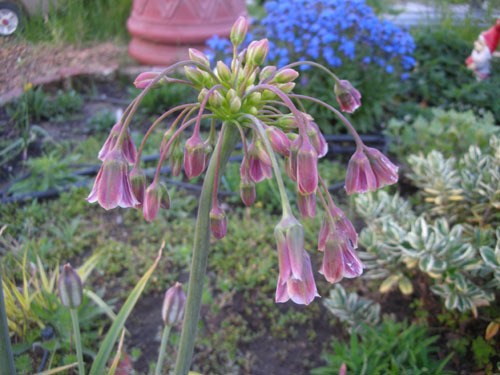 The weeping bells of flowers make it look like it is wearing a weird hat. 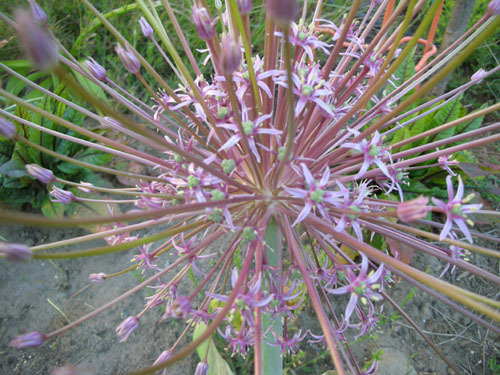 Unlike Allium schubertii. Only one of these is blooming this year, probably because I moved them to plant the apricot tree and they don't want to forgive me for that. Speaking of fruit trees, the cherry blossoms lasted only a short time this year. 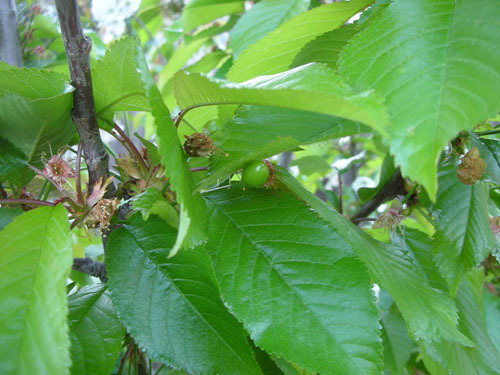 Now the blooms are faded and we've already got baby cherries. I've heard of cherries in the markets already, which is outstandingly early. 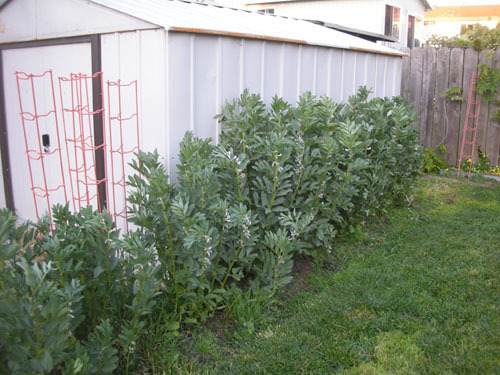 In other food news, the fava beans seem ready to take over the world. We're going to have lots and lots of beans. And lots. 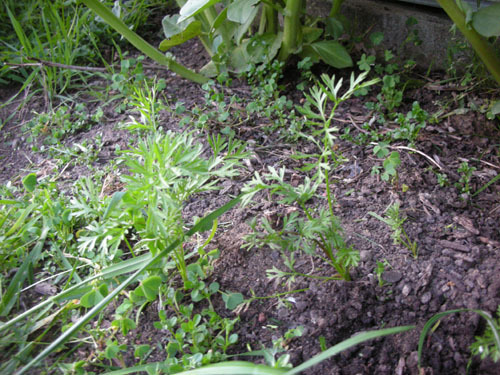 And the carrots I planted under them are looking good. These are from a sample packet I got at the Maker Faire. 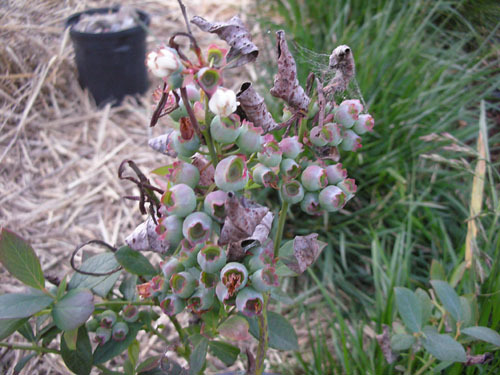 And the blueberries suddenly have real fruit on them, too. Not sure what's going on with the foliage there (I should read up on diseases of the blueberry), but this one has gone nuts and produced a huge amount of fruit. I'm dithering on the subject of the blueberries right now. I think I might like to keep them in containers, or maybe put them in the ground. I think I want to use them to partially block the view of the chicken yard, or maybe not. I lined them up in possible spots this evening to try them out (they will end up in pots about twice the size of the white one there when they have grown out more), and am still unsure. That little strip of lawn they are sitting on will be chewed away to make a planting bed, in part to add some mystery to the shed. So blueberries in pots would really anchor the space and add height. 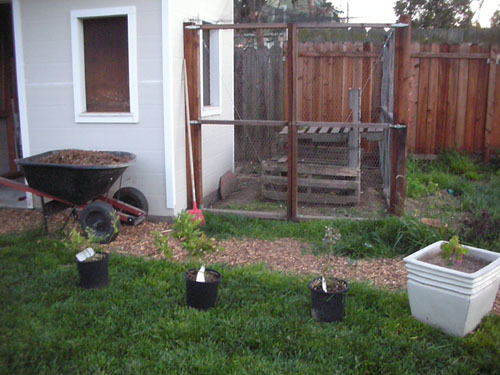 On the other hand, maybe I want less height, and blueberries in the ground would sink away nicely into a planting bed? Or maybe I want to put the blueberries somewhere else altogether? The plants will get to be six feet high and four feet wide, I think. They are now about two feet high, one foot wide. I keep moving them around the yard trying to find just the right spot for them. 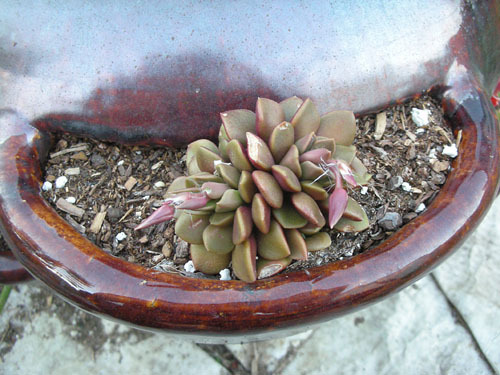 This is one reason for keeping them in pots for the time being: this dithering is not causing them any damage. And finally, of late I've been going into the chicken yard once a week and gathering a handful of this stuff. 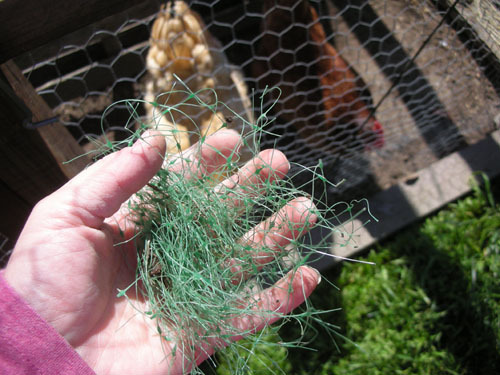 Those of you who have sodded yards may recognize it as the plastic mesh stabilizer for sod rolls. When we tear up a chunk of lawn, I put the sod pieces in the chicken yard and the girls peck and scratch at it, removing the grass and soil. Eventually all that is left is the sod chaff. If they were inclined to eat it this method of sorting out the plastic would not work so well, but they aren't, so it works like a charm. This method of getting the mesh out is so much more effective than my previous "sit there and pick it all apart by hand" method. It means that as I remove the sod (yes, the sod we paid so much for in both dollars and backbreaking labour), I can let the chickens earn their keep. They're just now working their way down to a level of the compost pile where there is a wodge of sod chunks, so I'm going in there weekly to clear out the plastic. The fact that the chicken involvement makes the compost burn down like it is on fire helps, too. Ayse - Bring on the garden posts!!! I can enjoy spring twice with your garden posts. Our tulips should be blooming in the next week or so. Hyacinths and daffodils blooming so far. Goldie looks very very mellow in the straw. Rosie is doing a great job demonstrating grass height. Ladybug poppies - what fun! We have plenty of the orange ones, but they are only at about 4 inches of foliage so far in PA.
Mebbe I'll have a couple of cherries next year. My tree should be arriving any day. Thanks for the inspiration! i love love love the ladybug poppies!